Let's face it: Helicopters are just cool. These machines are capable of hovering, an ability that heretofore belonged only to hummingbirds and insects. They can fly low over glimmering waterways or sweeping forests, and are incredibly dexterous, turning sharply in midair. Without a doubt, they are one of the most enjoyable and effective ways to travel. As far as we here in Bhutan are concerned, however, they are much, much more. They are a huge step forward in the country's transportation sector, and commerce overall. The birth of Royal Bhutan Helicopter Services Ltd marked a new era in this landlocked country, and our company continues to offer new benefits today. 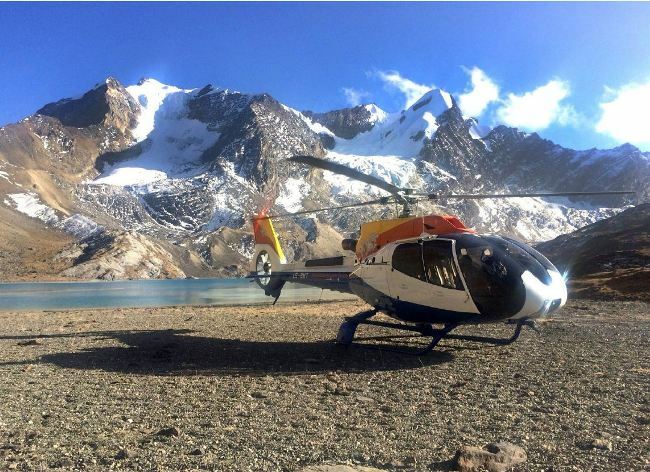 Bhutan Helicopter Services began operations in November 2015 and has safely transported more than 1,000 travelers. It has flown over 1,500 hours since operation begins. To outsiders, Bhutan is known for its jeweled jungles and soaring peaks, situated as it is on the slopes of the Himalayas. Every year, thousands of tourists flock to the country to take in its gorgeous countryside, hike its trails and pay homage to Taktsang Palphug Monastery – a.k.a. the Tiger’s Nest – which is one of the most stunning Buddhist sites on Earth. Clinging to the side of a cliff, and so named for the “tiger lair” caves that tunnel through it, the temple is a remarkable example of 17th century architecture. In the last several decades, Bhutan has become more and more accessible to outsiders, especially given the motivation tourism provides. As of 2014, Bhutan’s two airlines delivered almost a quarter million passengers to their destinations. It’s an impressive number – but a problem remained. To Bhutan’s inhabitants, the country is not nearly so navigable. With steep mountain terrain, choked jungles and rivers too fast to use for transport, our nation relies on its network of farm roads. Despite building more than 10,000 kilometers of road in the last 50 years, the terrain still poses a challenge, and goods and services often face interruption. Plus, Bhutan is landlocked between Tibet and India. As such, it has no ability to transport goods and trade by sea. Given the lack of feasible land on which to build airports, an effective helicopter network becomes even more important to the establishment of viable air services. Together, these reasons provided a solid impetus for the formation of an imperial helicopter company. Charge is per trip. Maximum of 5 passengers per trip. The heli scenic tour will begin by low overflying Paro valley covered in fertile rice fields along the meandering pa Cu rover which divides Paro valley. It passes over ancient rural villages followed by some of Bhutan’s most famous and prominent sights like Paro Rinpung Dzong built in 15th century which currently houses the administrative and monastic body of Paro. Slightly above the ridge is the Taa Dzong (currently National Museum) and minutes later a close up of the famous Tiger Nest Monastery! It's a breathtaking experience to see the monastery from the sky. Further heading North towards Mount Jumolhari flying along the Pa Chu over the ruins of Drugyel Dzong built in 1649. Mouth Jumolhari which stands at 7,320 metres above the sea level is straddled between the autonomous region of Tibet and Bhutan. It is also one of the highest virgin peaks in the world. Climbing is banned as Bhutanese believe that deities live on top of the mountain. The helicopter would then land at the base of Jumolhari (Jangothang) for a quick snack and selfie time. If you are lucky, you will get a chance to see the herds of Blue sheeps, Pseudonayaur, which are only found in the Himalayas. Unique Solution: Bhutan Helicopter Services Ltd. The Royal Bhutan Helicopter Services Ltd (RBHS) was established on November 11, 2015. The date was chosen in commemoration of His Majesty the Fourth Druk Gyalpo’s 60th birthday. Company headquarters are located in Paro Airport’s old hanger, from which home base our two H130 helicopters will travel all over Bhutan. In the first six months of RBHS’s life, the helicopters transported more than 400 individuals, and have now carried thousands. We also moved more than 40 medical patients from the countryside to the capital, Thimpu, in that time. In an effort to widen the helicopters’ reach, the Department of Air Transport is working to select and outfit new helipads all around the country. A 2010 request for proposal identified at least forty currently existing pads in 18 different dzongkhags (districts). Between updating these and building new ones, Bhutan Helicopter Services is set to expand steadily over the coming years. The helicopters, as they do in many countries, will serve important medical and law enforcement roles. The country plans to use them for search and rescue, evacuations, emergencies, firefighting efforts and natural disasters. They have also been employed for moving cargo as well as transporting important personnel and government officials. Now, they’ve entered a new stage: Tourism. Your journey deep into the kingdom's heartland explores three important but distinctly different valleys: The Laya Valley (also known as the hidden paradise), the tropical Punakha Valley with its magnificent Dzongs, and the emerald Paro Valley, with rice paddies and ancient temples. Bhutan Helicopter Services does more than provide our country with much-needed transit support. Now, we can also offer an experience of Bhutan unlike any other. When you travel by air, you will see sights the Bhutanese builders could not have imagined at the time they crafted the many monasteries, villages and ruins that dot the landscape. Be sure to bring your camera! The scenic tour begins with a low flight over the Paro Valley. The area, with its fertilize rice fields and the meandering Paro Chhu River that divides the valley in half, is an unparalleled sight. The river is wide and blue, with flat green banks extending on either side, and sandbars often visible along the winding turquoise length. We then pass over ancient rural villages, followed by followed by some of Bhutan’s most famous and prominent sights, such as Paro Rinpung Dzong. This Buddhist monastery and fortress was built in the 15th century, later renovated in the 17th century, and is surrounded by greenery and an impressive cantilevered bridge. It currently houses the administrative and monastic body of Paro. Slightly above the ridge is the Taa Dzong (currently the National Museum), and just minutes later, we will swoop low over the famous Tiger’s Nest Monastery for a close-up. With golden roofs, white walls and red accents, it is a true marvel. Seeing the monastery from the sky is a breathtaking experience, the only way to make a visit to such hallowed ground even more awesome. We then head further north towards Mount Jomolhari, still flying along the Paro Chhu River, and will soon pass over the ruins of Drugyel Dzong, built in 1649 and now a ruin. Mouth Jomolhari, which stands at 7,320 metres above sea level, is straddled between the autonomous region of Tibet and Bhutan. It is also one of the highest virgin peaks in the world. Climbing is banned, as Bhutanese believe that deities live on top of the mountain. The helicopter will then land at the Jomolhari basecamp, Jangothang, for a quick snack and selfie time. If you are lucky, you will get a chance to see the herds of blue sheep along the way. Properly called Pseudois nayaur or bharal, these sheep are only found in the Himalayas, in the countries of India, Nepal, Bhutan, Tibet and Pakistan. Blue sheep cling to the cliff sides of steep mountains, males living separately from females, feeding on grass. They are a rare sight to behold, but we often catch them in the air. From there, we will return to Paro, experiencing more of Bhutan’s unspoiled wilderness along the way. At Druk Asia, we specialize in introducing travelers to Bhutan, the colorful realm of the Thunder Dragon King. As the official representative of the Bhutanese Royal Government's National Carrier and a licensed tour operator in Bhutan, Singapore and Thailand, we provide all the services you need for a safe and memorable Bhutanese adventure. Druk Asia will handle your ticketing and visa paperwork, and help you plan a customized private journey, group tour or business trip to Bhutan. The charge for each helicopter tour is per trip, with a maximum of 5 passengers. Please book your party in advance.